One marketing tool used to attract buyers to a brokerage is rebates. A portion of the commission offered by the seller's broker to the agent bringing the buyer is credited/rebated to the buyer at or after closing. It isn't legal in all states. 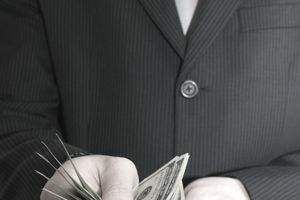 The Department of Justice believes that the ability to rebate buyers is important to competition and lower prices for consumers, and is attempting to get states with anti-rebate laws to repeal them. Of course, asking 100 real estate professionals what they think of rebates will get a lively discussion going. There is a lot of resistance to any practices that reduce commissions, but rebates have been growing in popularity and their usage. Generally, the rebating of say 1% of the purchase price on the buyer side, is around a third of the buyer agent commission. That's not chicken feed. In my own experience and a trial in my vacation home market, I didn't really get much if any new business offering rebates. As the median price of a home at the time was over $400k, vacation home buyers didn't seem to notice my marketing online. I have heard that in the first time and entry-level home buyer market, rebates can mean new furniture. The mechanics of paying the rebate vary, as sometimes it can be in the closing documentation, but not always. Some lenders have had issues with a rebate showing on the HUD. There doesn't have to be any trade-off of service for a buyer rebate. Some brokerages offer the rebate with all normal services included. This is a pure marketing strategy that assumes the brokerage can maintain profitability with a lower revenue on each buyer side transaction. If the brokerage has a large inventory of listings, buyer rebates can bring more buyers and increase revenue when the brokerage connects buyers with their own listings, handling both sides via a dual agency, designated agency or transaction brokerage. With the internet bringing huge amounts of listing information to buyers, many of them can locate the property they want to purchase online. At the very least, a buyer can shorten the list of candidate properties significantly by viewing them online, watching virtual tours and doing their own drive-by of the property. Some brokerages are offering rebates to these buyers, and not providing an agent to accompany them on showings, relying on open houses and listing agents for access. Showing services can usually be purchased separately when no other method can be found to get the buyer into the property. Anything that gives the consumer more choices and possibly saves them money for the services they desire is normally a good thing. It's a market efficiency when a buyer with the requisite knowledge can do some of the work of property location themselves and save money by doing so. There are those who criticize this business model, as they believe that the buyers are receiving monetary rebates for work being foisted onto the listing agents that must show the property. There is also a concern that some buyers might miss negative aspects of the property that a good buyer agent would have pointed out.